WARLORD UK was formed back in 1993 in Kings Norton, Birmingham, by Mark White, Mick Gorst and Andrew Stone. Apparently things went fast signing-wise and they also hooked up with new drummer Neil Hutton prior to his BENEDICTION days. Replacement Neil Farrington seems to have been a personality, and support slots with the likes of CANCER, ENTOMBED and AT THE GATES followed. Their first album, Maximum Carnage” came out in 1996 and in spite of a tour of Europe with BENEDICTION etc, etc. The band folded in 1998. Three years later Mark and Neil resumed their careers as WARLORD UK and they were soon busy live. Neil left just prior to their second effort “Evil Within” in 2010. Today the band is a four-piece consisting of Mark White on bass and vocals, guitarists Daniel Brookes and Lee Foley and session drummer Kevin Bartlett, while the search for a full-time replacement goes on. The ominous opener “When Worlds Collide” is a suitable hint of what´s coming your way. The sound is reminiscent of BENEDICTION and BOLT THROWER, as Mark growls and the guitars cut like muddled lasers. They mix styles and the solo is very nice so all in all the real opener is spot on. The Old School factor is about 120% as “Masses Gather in Masses” follows. The churning riff is augmented by delicate use of keyboards in the background. The light (for the genre) grooves and the spoken lyrics works well as a second intro of sorts, and the guitar work is lightly melodic. All in all the track is welcome change to the humourless wall of sound that death metal is mostly about these days. The very best on the album are both thrashing and light almost daring variety of “Last of Our Legacy” and the title track that sports a perfect riff, grooves and a highly effective yet almost simplistic refrain. There are no fillers here. 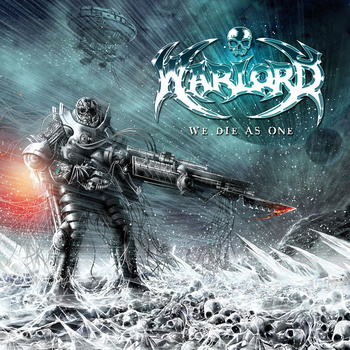 What I like about WARLORD UK is that they dare to be WARLORD UK and offer the discerning death metal head a sophisticated yet very heavy take on the genre. They don´t simply thunder along and they seem highly inventive when it comes to mixing in calm parts, subtle keyboards, female voices, spoken lyrics and whatever can be found on this highly recommended disc.